On July 16 (Fri), Mr. Katsuya Okada, Minister for Foreign Affairs of Japan paid a courtesy call on H.E. Mr. François Fillon, Prime Minister of the French Republic, who is visiting Japan, at the official residence of the French Ambassador to Japan. The outline of their meeting is as follows. 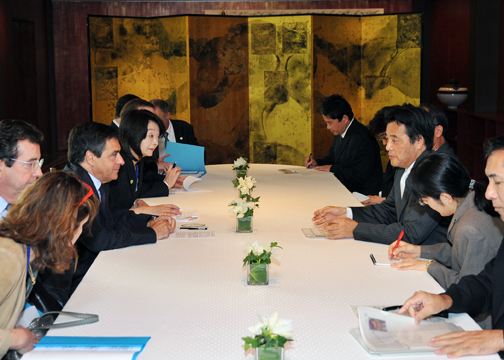 At the start of the meeting, Minister Okada welcomed Prime Minister Fillon and stated that he had a meaningful exchange of opinions with Mr. Bernard Kouchner, Minister of Foreign and European Affairs of the French Republic, who visited Japan this March, and said that he would like to take advantage of these visits to strengthen Japan-France relations. 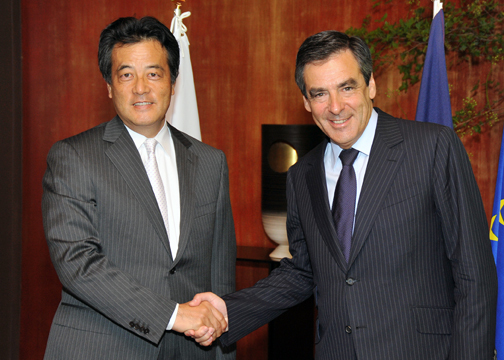 In response, Prime Minister Fillon stated that he was honored to meet Minister Okada. He stated that Japan-France relations were very good, but because good relations had continued for so long, interest in one another had waned off and as a pro-Japan person, he felt the necessity of further strengthening Japan-France relations and stated that he thought that there were fields in which further cooperation could be pursued, including international issues such as global governance, nuclear, aviation industry, biotechnology and environmental protection. Prime Minister Fillon stated that the United Nations Security Council reform was important as one form of global governance, and that France supported Japan’s bid to become a permanent member of the Security Council. Minister Okada expressed gratitude for France’s support, and stated that Japan would work actively for the UN Security Council reform, and the two confirmed that the two countries would cooperate closely on how to move forward on this matter. Regarding the situation in Afghanistan, Minister Okada stated that he would attend the Kabul International Conference on July 20, and that while there were issues of governance and corruption in Afghanistan, Japan planned to implement its assistance package of a maximum of about 5 billion US dollars over five years efficiently and appropriately. He also stated that he expected that the Peace and Reintegration Program would be officially announced at the Kabul International Conference. Minister Fillon responded that he had high regard for Japan’s assistance to Afghanistan. He also stated that France would also support economic activities in the civilian sector as well as the construction of hospitals and schools. At the same time, Prime Minister Fillon said, it was important to strengthen the Afghan police and military in order to build an environment so that the militaries of foreign countries, including France, could withdraw from Afghanistan. Prime Minister Fillon and Minister Okada also exchanged opinions on other matters such as the situation in Iran and African development. Regarding African development, Prime Minister Fillon stated that from the viewpoint of securing energy and water resources as well as measures against global warming, it was important to provide support for innovative financing system. Minister Okada responded that Japan would host the Plenary Meeting of the Leading Group on Innovative Financing for Development, over which he would preside as chair, and he intended to draw up Japan’s ideas in anticipation of this meeting. He also stated that awareness on innovative financing was still low in Asia and he would like to spread awareness.